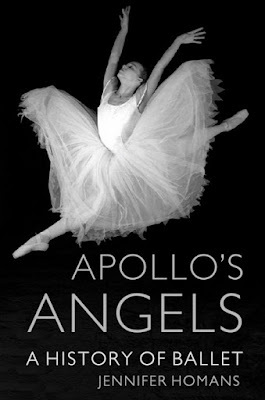 Jennifer Homans, Apollo’s Angels – A History of Ballet, London, Granta, 2010. Ballet is an art form rooted in the Italian Renaissance during which a renewed interest in the classical texts was pursued. It has to do with harmony, proportions and ideals, aspects perfectly embodied by Apollo, "the god of civilization and healing, prophecy and music". And ballet dancers can be compared to angels (as Balanchine does), with their ethereal and imalpable movement quality. Choosing to refer to both Apollo and angels in the title of this book, is a particularly sophisticated choice. When Apollo's Angels was published five years ago, it stirred a controversial debate on the state of the art, because the Epilogue declared the end of an era and the possible death of ballet. Reviews flocked and debated the question (here and here two examples) without focusing much on the previous chapters and the enormous work Homans had accomplished (see here for a more comprehensive view). I will return to the Epilogue, but for now I would like to focus on the subtitle, "a history of ballet" where the choice of the indefinite article says it all. Homans's perspective is not The perspective (or "Olympian truth" as one critic labelled it) but her own and is the result of a decade of research and a "lifetime spent in dance". To begin with, the book does not simply follow the development of this “system of movement as rigorous and demanding as any language” that we call ballet, but inserts it in a cultural, social, economic and historical context that makes its meaning and achievements much clearer and more powerful. For example, August Bourneville’s Danish ballet, which was essential to preserve the Romantic tradition, owns a lot to the writings of Hans Christian Andersen, who was very interested in ballet (he even tried to become a dancer) and “imagined women as sylph-like figures, unattainable and alluring”. He reworked Danish folklore changing “the occult worlds that had informed the French Romantic ballet”. That is why, Bourneville’s Sylphide exemplifies a “fanciful bourgeois domesticity” where the male title role is given more substance with respect to the original French work and the story is transformed in his “regrettable lack of self-control” rather than “the loss of the sylphide”. Another enlightening example connects Russian ballet with serfdom, “the Imperial Theatres of Moscow and St. Petersburg were both fed by serfs from serf theatres, and it is this strange social and political phenomenon that provided a blueprint for the art”. According to Homans, this aspect contributed to shaping Russian dancers’ submission to authority, “their sense of duty, and the reverence and humility they bring to their tradition”. Then, Homans, throughout the history she recounts, focuses on the description of ballets, steps, dancers and choreographers letting us almost vividly see them. She was a ballet dancer before becoming a historian, and this probably helped to pay special attention to the steps. For instance, the five basic feet positions that constitute the skeleton of ballet and were codified by Pierre Beauchamps in the seventeenth century, were a question of etiquette, posture and body mapping, “first position was a gathering point, a ‘home’ or balletic equivalent of a musical tonic, in which the body stood elegantly at rest, heel to heel, legs slightly turned out at the hip. The other four positions prepared the body to move”. Among the choreographers she pays a due tribute to George Balanchine who emigrated from Russia to the United States, laid the foundation of ballet where there was almost nothing, and transformed it into a superb twentieth-century art form, firmly keeping its bond with the past, “for him ballet was an art of angels, of idealized and elevated human figures, beautiful, chivalric, and above all strictly formal”. Serenade is a perfect example, with its refined allure, buoyant dynamism and witty irony and Agon represents a milestone in ballet history with its sharp lines, upbeat rhythm and chromatic black and white contrast. With regards to other choreographers, something more could have been said on Michel Fokine and something less on Jerome Robbins, whereas Kenneth MacMillan was too quickly dismissed. Last but not least, Homans’s writing style is impeccable and makes this five hundred and fifty pages tome a page-turner book. One simply does not want to put it down. Homans commands her prose wonderfully, tying up her analysis with humour and sagacity, as when she talks of Italian choreographer Luigi Manzotti, “it was a stunning paradox: Manzotti’s meretricious and bombastic dances – which had pushed ballet as far from antiquity as kitsch could take it – would become a vital element in the making of high Russian classicism” or when she deals with Soviet ballet, and, in particular, with Bolshoi style in Grigorovich’s Spartacus, “it appeared classical – the steps were all there – but it was not. Grigorovich had crushed ballet’s delicate internal filigree and erected an arduous athleticism in its place”. Coming to the much-debated Epilogue, it is important to set it in relation to the rest of the book. Homans highlights how the development of ballet was related to the affirmation of the nation states that gave birth to the many schools and approaches, like the Cecchetti or the Vaganova school. Ballet masters and choreographers often travelled and moved from one country to another, as it happened with the French ballet master Marius Petipa, the creator of Sleeping Beauty who worked at St. Petersburgh’s Imperial court and with the Ballets Russes who became famous in Paris, not in their homeland. But, in general, it was the political and cultural decisions of each nation state that decided the fate of ballet as it occurred with Denmark or Russia. Nowadays, with globalization, “national distinctions have been flattened into a common international style” and “rather than perfecting a native tongue, they [dancers] speak a mellifluous hybrid language”. I do not think Homans to be nostalgic of the Cold War, she just focuses on the fact that at its end, something got lost, a legacy that Petipa had from his French school and Balanchine from his Russian has not been properly transmitted to the future generations that tend to revere their past without being able to fully grasp it, “today we no longer believe in ballet’s ideals. We are skeptical of elitism and skill, which seem exclusionary and divisive”. Can ballet really survive such big changes? Maybe; Homans’s bitter-ending is not a mere provocation, but a call to action addressed to dancers, choreographers, scholars and all those who are part of this centuries-old tradition. It is vital to reflect on ballet history and language, and learn about its transformations, because ballet is not just about "the next genius", but about "honor, decorum, civility and taste (...). We would have to admire ballet again, not only as an impressive athletic display but as a set of ethical principles".